Back in September, I was asked to participate in the planning of a consultation on leadership (Six Agency Leadership Initiative Consultation). It was a consultation that would be sponsored by the six agencies of the General Assembly (GA) of the Presbyterian Church U.S.A. (Office of General Assembly, Board of Pensions, Presbyterian Publishing Corporation, Presbyterian Church Foundation, Investment and Loan Program, and General Assembly Mission Council). You can see pictures of the event here. The consultation was to focus on what leadership in the church looks like today in the 21st century and how the six agencies can better support them. In a way, we were inviting “those who had understanding of the times” to share in dialogue not to give advice, direction, or even suggestions, but so that the agency folk could eavesdrop, listen, and observe. It is clear that this denomination is going through a lot of change and not just change for change sake, but that there is something in the air (the Holy Spirit, perhaps?). 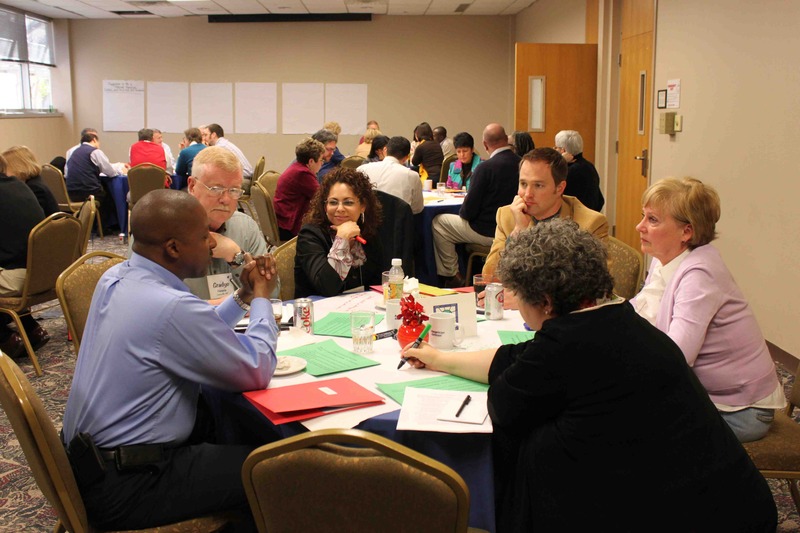 There are some exciting, stimulating, and spirit-filled conversations happening from changing the way General Assemblies function to evaluating the function and purpose of middle governing bodies. There is even a committee called the Nature of the Church for the 21st Century. For this consultation, we were intentional about bringing together a diverse group of folks: elders/ministers, younger/older, small/large congregations, executive presbyters/seminary presidents, conservative/liberal, racial ethnic, new church developments, tall steeple, etc. The question now is how do you have thought-provoking, spirit-filled, and truly engaging conversation with such a diverse group of people? How do we allow diversity to be an asset and not a divisive element? One thing was clear was that we couldn’t use old conversation or consultation models if we were to have conversations about life and ministry in the 21st century. The design we decided to use is very process-oriented and not results-oriented. The conversations were the important part of the consultation, not any expectation to answer or solve the challenges of leadership for today. What makes you get up in the morning? And what keeps you going? Articulate a spiritual struggle with which you wrestle. Identify an area of frequent prayer and reflection for you. Express one hope you have for the church and/or ministry in the future. What people, places, or events shaped your life of faith? On the first night of our gathering and after initial introductions and community building activities, we had worship and in the midst of worship, we put a face to our spiritual biographies. By using mutual invitation, each participant was given an opportunity (about a minute) to lift up one thing from their spiritual biography or express something else they wanted to share. This continued the next morning during morning worship. The rest of the day was filled with two conversations: Qualities of Leaders the Church Needs and the Church’s Call in the 21st Century. We used the World Cafe model to guide these conversations. Each of the six tables had a table host (they were people from the planning team) and a listener (a GA agency representative). The host initiated the conversation as well as did a recap to the next set of conversationalists. The listener simply did just that – listened. This was important because as a part of this consultation, we also had a writer. The writer’s task was to observe, interview, and listen so that in the end, she could produce a writing document that encompassed the spirit and content of what was discussed at the consultation. This document was to be a tool for the six GA representatives to share with their agency and therefore use as they fine ways to better support leadership of today. Who/What inspires you in leadership? How is this inspiration conveyed-reading, music, personal discussion, etc.? How do you measure your effectiveness as a leader? What are the products or result of effective leadership? How do you measure effective leadership in others? How is your leadership style adapted to address your present context? What factors in your present context challenge your ability to provide leadership? What factors in your present context enhance your ability to provide leadership? With whom do you share in leadership responsibilities? How were these persons identified for leadership and by whom? Describe the ways in which leadership is shared. Is there a delegation of tasks or mutual agreement about assignments? Are planning activities explicit or intuitive? How are new persons nurtured for leadership responsibilities? How frequently are leadership roles changed within your present context? Within your context, what makes leadership difficult to sustain? Do you find the challenges to leadership to be institutional? Cultural? Episodic? Continual? What fosters such challenges? Are there particular aspects of your context that provide unique challenges to leadership of your community? Are partnership activities with other persons and organizations a resource you use to overcome obstacles? Are there church institutional behaviors that thwart leadership development in your context? How does the middle governing body relate to the obstacles you can identify? In what ways do you consciously seek to nurture your own leadership abilities? From where or whom do you receive assistance with this? What kind of assistance do you receive? Are there church institutional practices that enhance your capacity for leadership? What are they? How do the middle governing bodies in your context encourage you in your leadership role? In a crisis situation regarding your leadership, to whom do you repair? Where can you turn for help and guidance? In your ministry context what degree of diversity of leadership styles are you able to observe? Do these forms of leadership compete or complement each other and in what ways? Are church institutional structures and practices more able to affirm some styles of leadership but not others? How might church practices adopt a more affirming approach to diverse leadership styles? Are there practices that privilege particular qualities of leadership and devalue other leadership qualities? How do these patterns influence ministry in your context? to a new openness to God’s continuing reformation of the Church ecumenical, that it might be a more effective instrument of mission in the world. QUESTION: How does G-3.0401 hold up to your experience in leadership and how do you as a leader hold up to its expectation? Later that evening, we spent time praying about this matter. We lifted up prayer not only through word, but also through interactive prayer stations. It’s one thing to talk about it, but another thing to also pray about it. On the last day, our writer (thank you Sharon Youngs) shared what she had heard and observed. She presented it to the group for input and mostly to make sure that it reflected the spirit of the conversation. We were in awe of the poetic nature of what came out. What are the characteristics considered necessary for effective leaders for the church in the 21st century? claiming in word and action that relationships are foundational to results. Where is God in our midst? trusting the wisdom of the community. What then shall we say to this? What will happen when effective leadership is paired with the church of the 21st century? The ‘possibilities and perils’ of the church in this present time are very real. An effective leader will need to have an appreciation of both. Perhaps one of the most important leadership characteristics will be the courage to invite all of us to live into the heart of our anxiety – especially the fear of letting go of the familiar and the need to control – and to help create the space to discern and articulate God’s vision for us, call forth gifts, exude hope, and joyfully trust in the redemptive power of God and the movement of the Spirit in and through the community of faith. What is emerging is larger than we can envision, and is guided by the One who is able to do more than we dare to ask or imagine, the God who is ever moving over the face of the waters. Nimble, faith-filled leaders who shape the evolving, flexible structure we call church will best support the quest to be responsive and obedient to God’s call from up ahead and deep within. The structure and characteristics will change with each new generation; what we do now in this early part of the 21st century will be seeds for what is to come. Yet, the work of sharing the gospel in word and deed is always before us – as is the abiding presence and power of God through Jesus Christ. I share the process and the reasons designing the consultation this way because I believe the model worked well to generate and foster good conversations, especially in the midst of diversity. I believe that this model levels any possible hierarchy or division. I am already planning to use and adapt this model for other conversations in my own presbytery. What other models of conversation have you found helpful in fostering conversations in a diverse community? who is that fat guy in the blue shirt? I especially thank you for leading the process and sharing it so effectively! Thanks Linda! It was wonderful to be a part of and meet such amazing leaders.